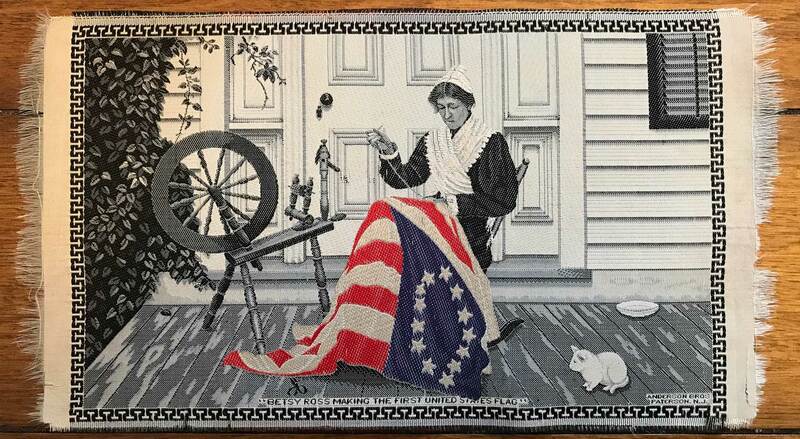 "Betsy Ross making the first United States flag"
Home > Americana & Unusual > "Betsy Ross making the first United States flag"
"Betsy Ross making the first United States flag" Original beautiful Jacquard-woven silk picture. Manufactured by Anderson Bros., Paterson, N.J. in the late 1800s, this marvelous illustration features Betsy Ross making the first United States flag. Ross is depicted sitting and sewing the flag with her spinning wheel. Black and white illustration features still-vibrant coloring on the flag itself in blue and red. Some trivial edge yet in overall excellent “Museum Quality” condition. Measures roughly 9" x 5.25"